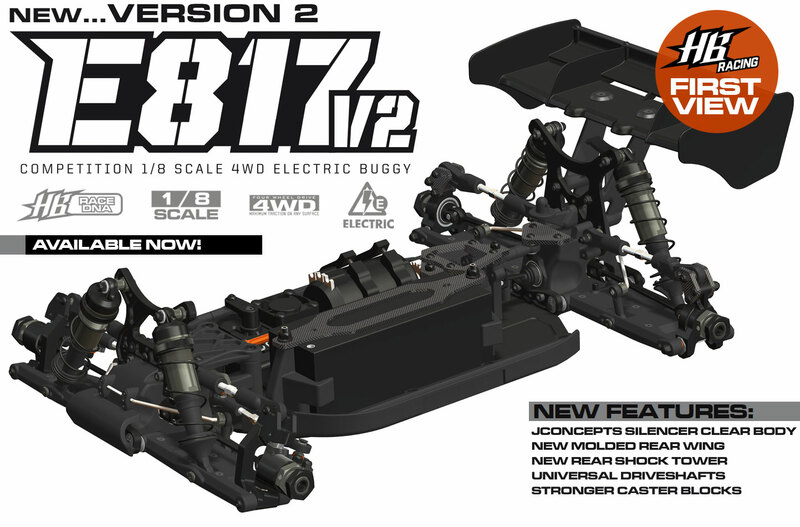 Get ready, the E817 V2 1/8 scale 4WD electric buggy is coming soon from HB Racing. The new “Version 2” of the E817 buggy is topped with a clear JConcepts Silencer buggy body and a new molded nylon rear wing that is lightweight and more durable than polycarbonate wings. A narrow rear shock tower with revised shock length has been added for expanded range of shock adjustment. New machined aluminum 17.5° front caster blocks have been updated for extra strength. New aluminum steering linkage spacers replace the plastic spacers for improved bumpsteer geometry, more precise adjustment, less flex, and we revised the screw lengths to accommodate the new spacers. Other updates include universal drive shafts, increased clearance ball end links, and updated body mounts.